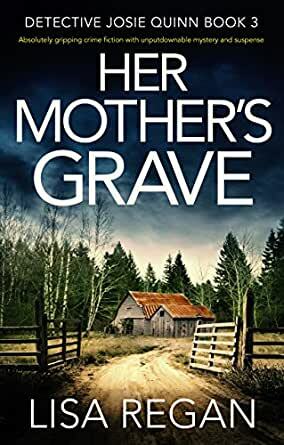 Josie hasn’t seen her mother in years but, with an undeniable connection between her mother and the dead girl, does she dare track her down? Do you love unputdownable crime thrillers that keep you up all night? Then this gripping rollercoaster ride, perfect for fans of Angela Marsons, Robert Dugoni and Rachel Caine, will have you totally hooked! I didn't want this book to finish, but knowing there will be more Josie Quinn stories I am happy, I read the three books in 3 days couldn't stop didn't want to stop, as usual what you think will happen takes a turn then twists around and omfg it is really I had no idea it was ....... You can see where the relationship between Josie and Noah are heading but it is always about the crime and solving it, what a mind Lisa has to write 3 books as great as each other that is a gift in itself, going to check out more by this author, read these books in order so you will know who is who and the relationship and connection to Josie, just brilliant. 5.0 out of 5 starsMysteries..
Omg ALL three books were so so good.mi couldn’t stop reading. I just finished book 3 and I highly recommend this series to mystery loved version. The twists and intensity of each story had no boundaries. They just kept coming. You think you’ve figured it out but then it twists the other way, they were all mind blowing. I looked for book 4 but no luck but thank you for such brilliant stories. Am about to look for more books written by you. 5.0 out of 5 starsBest book I've read in ages. I read this book immediately after the second book and plan on reading number 1 and number 4. I like her style of writing and as complex as the storyline can get, it's still easy to follow. I like being surprised and although I had an inkling of the twist, it still kept me captivated. Really good book. I have enjoyed all of Lisa's books, the first one I read was Finding Clare Fletcher and loved it. Love her work. 5.0 out of 5 starsBest Josie Quinn yet! Excellent read. Can't wait for the next one. 5.0 out of 5 starsVery enjoyable.